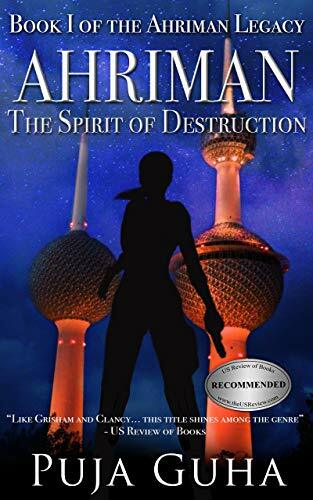 When the CIA intercepts intelligence on a terrorist attack in Kuwait, Petra Shirazi, a former field agent, comes face to face with the Ahriman, one of Iran’s deadliest assassins. After a disastrous mission forces her out of the field, Petra Shirazi retires from a life of espionage to work in a research position. Three years later, her division stumbles upon a money trail that reveals a massive new wave of terrorist attacks. The money trail places her in the midst of an assassination plot that implicates the highest levels of the Kuwaiti and Iranian governments. Petra will find herself face to face with the Ahriman, a man named for the Persian spirit of destruction who is responsible for a series of bomb blasts that paralyzed the Suez Canal two years earlier. As the investigation begins to unravel, the ripple effects threaten to engulf not only the Middle East and its Western allies, but also the darkest secrets of Petra’s past. Petra was recruited for The Agency from college. Her field work gained her high accolades but after an episode of PTSD retires her from that life, she settles in as a researcher. That is, until a mission that only her special skills can handle pulls her out of the office. Will she be able to push through the past or will it leave her paralyzed in the field? The author presents the reader with a different perspective of Agency work. The employees are not portrayed as super-heroes but as real people with real life thoughts and feelings. Ms. Puja Guha also weaves the past and present events in a different way than I have seen in other stories. It took me a little bit to catch the underlying thread but when I did I was wondering how it would all work out. I also enjoyed how the reader saw a different perspective on Middle Eastern culture.